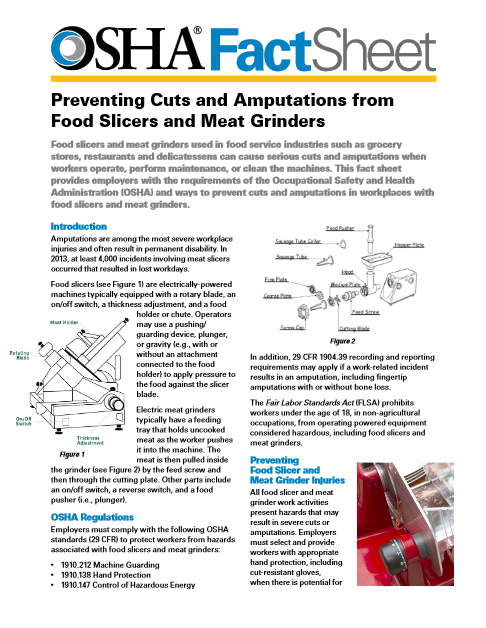 OSHA has just released a new fact sheet for food slicers and meat grinders intended to prevent amputations and serious cuts. Meat grinders and food slicers are designed to grind and slice meat but all too often they slice, cut and grind the hands and fingers of those in the food industry who are operating the machines. 2013 saw some 4,000 reported incidents (not to mention the lesser cuts and injuries that went unreported). The 3-page free pdf download entitled “Preventing Cuts and Amputations fromFood Slicers and Meat Grinders” contains photos, schematics and diagrams (as seen in the image above) to help make sense of procedures. This entry was posted in General and tagged Amputations, cuts, Fact Sheet, Food, Grinders, Meat, OSHA, Slicers. Bookmark the permalink. with you (not that I really would wanmt to…HaHa). You definitely put a brand neww spkn on a topic that’s been written about for a long time.